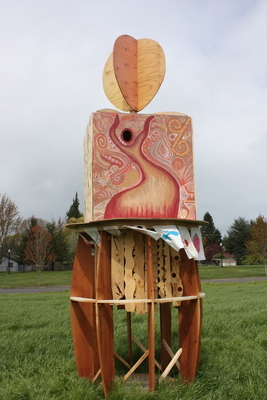 Fecundidad is the collaborative sculpture built by the Introduction to Studio class at Linfield College during the 2013 January term. On April 19, 2013, the sculpture was burned to the ground in the field west of Miller Fine Arts. The Introduction to Studio class included peer teacher Laura Goodwin and students Katie DeVore, Ryan Ishihara, Arianne King, Lukas Kleinman, Celeste Knopf, Lyndsie Lemerande, Micah Roos, Hunter Sams, Emma Sandaine, Chastilynn Tittle, Noemy Vega, Alan Venegas, Kasey Wilcox, and Nicole Wilson. Goodwin, Laura, "Fecundidad Collaborative Burn Sculpture 06" (2013). Introduction to Studio Collaborative Sculptures. Image. Submission 81.